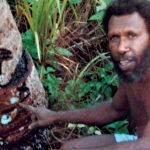 A blog about the birth and death of an Australian myth. as Ellen Kellys second husband George King. of a NSW Horse Stealer named George King. Is it the same man as in the top picture? George King was Ellen Kelly’s second husband. They were married on February 19th, 1874, in Benalla. Its commonly said that he came from California, was a horse thief and that he deserted Ellen Kelly in about 1877 after fathering three of her children. But when you drill deeper into the detail about who exactly George King was, where he came from and where he ended up, his marriage to Ellen Kelly is about the only thing we know for sure about him. 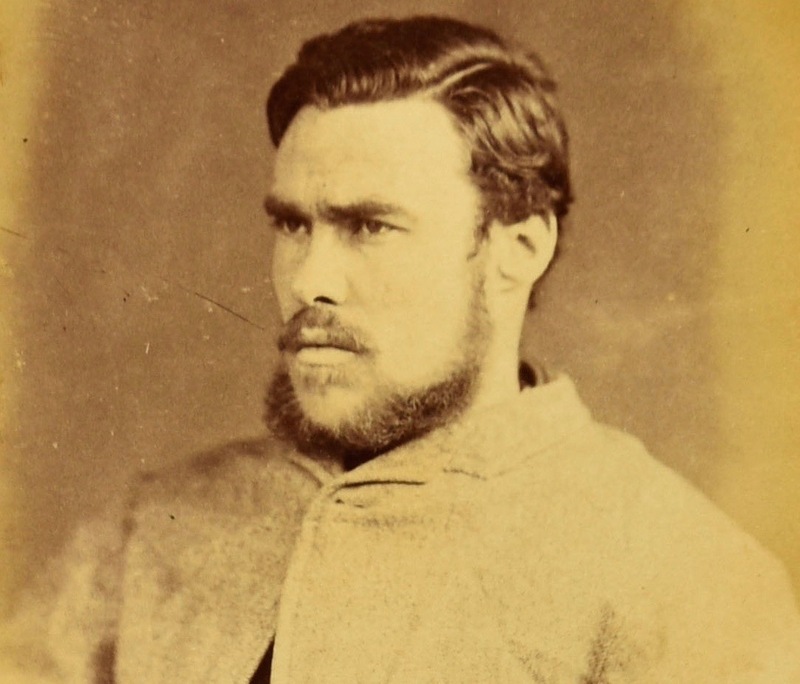 In 2002 a photo said to be of George King was listed for auction by Christies in Melbourne. The Catalogue reported that Ian Jones had proposed that it might be George King in 1995, and “After comparison with several portraits of Kings children, family members accepted the identification”Given the absolute certainty with which Ian Jones wrongly declared a different photo from that same catalogue to be Ned Kelly, and the recent brouhaha over the ID of the Kelly Vaults latest addition, a photo also said to be of Ned Kelly, one has to treat these photo identifications with some caution. But lets say it really is George King. What else do we know? In the Jerilderie letter Ned Kelly described George King as a ‘horse stealer’, and indeed there was a horse thief of that name. He served time at Darlinghurst Gaol in Sydney for horse stealing and according to his prison record was a native of NSW born in 1847. He was released on January 3rd, 1874. The prison record also includes a very clear portrait of the man, and according to many, the resemblances between these two photos are so striking they’re convinced it’s the same person. It may well be. I’ve copied the prison record and the photos for you to compare and make your own assessment. As is usual in the Kelly story, there are problems with accepting that these two people are one and the same person, that Ellen Kelly married the NSW horse stealer. The first one is minor – but it means that George, aged 25, travelled to the isolation of rural Victoria, met and married 41 year old Ellen Kelly in a mere six weeks after his release in the bustling city of Sydney. Whirlwind romance, for sure, and not impossible but does it really hang together? Maybe. The second more challenging problem for Kelly supporters is that it means the child said to be the first of the three of Ellen’s listed as George King’s could not have been – Ellen King was born on November 3rd 1873. The entire pregnancy began and ended while George was in Darlinghurst Gaol. Given Ellen Kelly’s history of a pre-marital first pregnancy and of an affair with Bill Frost, an affair with another person, unknown, is not entirely out of the question. So, the choice is to either accept that Mrs Kelly had an affair with some unknown person and the NSW horse stealer accepted the child as his, or else reject the horse stealer as the George King that Ellen Kelly married. If someone was interested, this dilemma could most likely be resolved by DNA comparisons between descendants of Ellen King, such as Leigh Olver, and any descendants of the other two children Ellen Kelly had with George King. It would soon become apparent if they all had genetic material in common that wasn’t from Ellen Kelly. If they did, that would rule out the horse stealer. The prison George King could read and write. The George King that married Ellen Kelly could not. The prison George King had an anchor tattoo, said elsewhere to have been popular among merchant mariners who had crossed the Atlantic ocean (or Pacific, or both). The dilemma is not as easy to resolve as you suggest through DNA. The offspring siblings that include Ellen, Alice and Jack King all would share the same mitochondrial DNA line to Ellen Kelly/King. To differentiate DNA between the siblings would involve isolating George King’s paternal DNA data. This would be difficult considering there are NO KNOWN pedigree parents and siblings or other offspring descendants from George King to gather paternal data from. One would have to rely on a known DNA descendant from Alice King to be able to compare possible paternal data with Ellen King’s offspring. How do you isolate the paternal data if there are no other candidates to compare. Apparently Jack King’s offspring have also mysteriously vanished and so this would be difficult to compare and validate. Thanks JL. I agree it wouldn't be easy and it certainly couldn't be done using Leigh Olvers mitochondrial DNA as was the case with the identification of Ned Kellys bones. I am not a geneticist but I am guessing that if a number of samples from the descendants of accepted King progeny Alice or Jack could be compared with each other, there would be a number of similarities between them that derived from George Kings DNA and which would also be present in Ellen Kings descendants if indeed she was a true King. Obviously those similarities wouldn't be there if Ellen Kings father was not George. This wouldn't prove anything but could strengthen the case for the Horse Stealer being the man Ellen Kelly married. His DNA would not appear in Ellen Kings line, he being in Darlinghurst Gaol at the time she was conceived. Cant see anyone being interested enough to test that theory, can you? It might be of interest to Leigh Olver though. Bricky Williamson claimed in 1879 to have earlier fathered a child – Ellen – by Ellen Kelly [The Kelly Gang Unmasked: 2012: p. 167]. Boundary rider William Frost had earlier, in 1869, also fathered a child Ellen who died in January 1872 [Ibid: pp 41-42]. If George King and Ellen did not get on well as has been frequently suggested in other books, we cannot be absolutely certain of every aspect of the Kelly genealogical history. The police may have treated Mrs Ellen Kelly and Bricky Williamson as related. There is a letter from 7 May 1879 to the Lands Department in which Superintendent Nicolson recommended that the selections of both Mrs Kelly and Bricky Williamson who were imprisoned at the time should be forfeit as desirable “for a complete clearance of the family from that locality”. This is highlighted in Peter Fitzsimon’s ‘Mrs Kelly’. He gives the reference as VPRS 4965, P2, Unit 4 Item 177. Did Bricky father baby Ellen? Mrs Kelly was by Grantlee Kieza. Bricky could be the father of Ellen, and that would make way for George the Horse stealer. I am just wondering what it was about Ellen Kelly that she could persuade a much younger man to marry her in her poverty stricken state and take on her great brood of kids? I am also wondering, if he wasn't the father of baby Ellen, why George would allow his name to go on her birth certificate? Those considerations lead me to have second thoughts about George the horse stealer being our man! What we need to know a lot more about are the social customs and mores of the time. 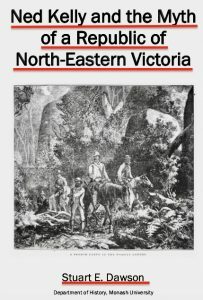 Hi Curious I have found the section that you have mentioned VPRS4965,unit 4,Item177 and is indeed mentioned in Peter Fitzsimons Ned Kelly and is on page 805 under the heading Reports and papers.However the description of that paper according to Fitzsimons says it is in relation to The List of suspects in the North East .District.I have looked in Grantlees book and cannot find it but that doesn't mean that it is not there.There are pages and pages of references in his book and could have easily missed it as I have done before.As far as PROV goes have never used it and Mark Perry might be able to locate it.If it exists Sharon would certainly find its contents. "Because Ellen was illiterate, George, too, chose to sign his name with a cross." Ian Jones, 'A short life', end of chapter 4. I don't think author Peter FitsSimons ever graced the Reading Room at Public Record Office Victoria for study purposes. Perhaps one of his army of research assistants did. The records at PROV are pretty good I'm told. The only reason I mention this is that Peter FitzSimons' Eureka book and his Ned Kelly book quote PROV archival sources, even though Peter never conducted research there. It is relatively common for archival sources to be nicked to create the illusion that another author had done this research himself or herself. I am not alleging Peter FitzSimons did this. I don't have access to the State Archive's researcher records. It would be a horrible irony, though, if Peter FitzSimons accepted Ian Jones' advice to ignore "The Kelly Gang Unmasked" book altogether, yet gobbled up the archival references produced in it. That would be a heaps worse than plagiarism. Study is ongoing. Remember there is no proof so far other than records quoted but perhaps not actually accessed. You've got things arse-about (excuse the language) Anonymous. Dagmar Balcarek, among others, states Ellen was literate and covered up for George by adding 'her mark'. Ellen Kelly's Land file is among the missing Kelly documents at the State Archive. It would have shown her letter-writing abilities for all to see. You guys are about to miss out on your big chance to own "The Ned Kelly Such is Life Cuckoo Clock" advertised in The Herald Sun TV Guide yesterday. 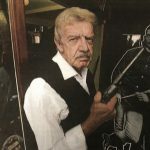 On the hour miniature doors WITH A EUREKA FLAG fly open and "a hand-crafted sculpture of Ned Kelly emerges to the sound of authentic gunfire". At a total cost of $ 319.94 incl postage, this is not a cheep cuckoo clock. The full-page ad does not say the clocks are made in Australia. If made in China, the profit margin for the seller is probably large. On the plus side, you can turn off the SOUND OF REAL GUNFIRE (perhaps an AK-47). As everyone here know, Ned never uttered the words 'Such is Life', and Ned is in no way whatever associated with the Eureka flag. According to dates on the cuckoo clock, Ned wasn't even born when the Eureka rebellion was quelled. So Dave are you saying Ian Jones was wrong about Ellen being illiterate, and Dagmar Balcarek is right? Or is Dagmar wrong and Ian is right? Or are they both arse-up (excuse the language) and both signed their names with a cross when they could both write? Was Ned Kelly the only one there that could write? Was he even there at all? I would rather have my eyeballs sucked out by a goat than have this monstrosity hanging on my wall. How about if every hour Ned Kelly comes out and is hanged? Ned signed as witness Edward Kelly. The other witness was William Skilling who made his mark. Thank you Dave but you are avoiding the question! Are you saying Ian Jones was wrong about Ellen being illiterate, and Dagmar Balcarek is right? Or is Dagmar wrong and Ian is right? Or are they both wrong, and both Ellen and George signed their names with a cross when they could both write? Since you said I got it back to front when all I did was quote Ian Jones, then either Jones is wrong, or Balcareck is wrong, or they are both wrong, with both Ellen and George being able to read and write but both signing with a mark for some reason. Your call. Thanks you Dave. Is the example of Ellen's writing on a publicly accessible document like a government file? 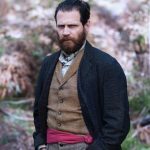 Foxtel is flogging the Lawless series like a dead horse. Saw an episode last evening about Ben Hall, repeated this morning. This reminded me that the forensic guy and lady historian from Adelaide were duds. Archaeologist Adam couldn't discover exactly where Hall had been shot but thought he had come close. I didn't. All this goes to show that if you have a respected front man like Mike Munro backed by a bunch of academic wafflers, you can still come up with a series idea that gets Foxtel backing. 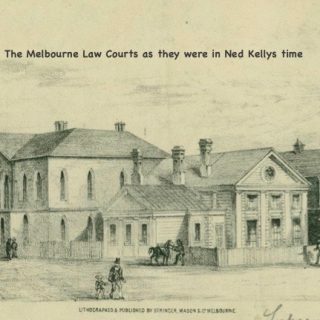 Dee, you liked aspects of the Lawless Ned Kelly show, but what sticks in my gullet is Leo Kennedy's craven acceptance of Adam's site where his great-grandpa had been killed. Although viewers were never was shown exactly where this had happened, Bill Denheld – the acknowledged SBC expect had previously shown Leo the correct place. Watching the Ben Hall repeats I couldn't help notice how a camera can affect interviews and experts alike. Why would George King give his place of birth as California to the registrar when he and Ellen were married if it were not true? Also, as Brian Stevenson reminded me, Ian Jones says that George signed a cross on the marriage certificate as noted above, but says that later that same day "he wrote his name with a flourish" on the birth registration for their daughter. 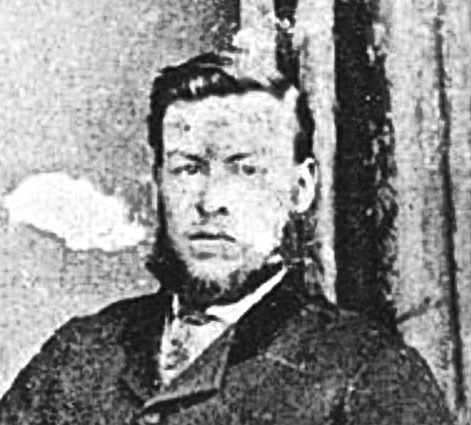 George King's role in the Kelly saga is shrouded in mystery from start to finish. It seems there are myths and different versions of almost every part of Kelly history however on King there is very little excepting his mention in the Jerilderie letter. Of particular note is his abrupt and largely unexplained disappearance from the scene. 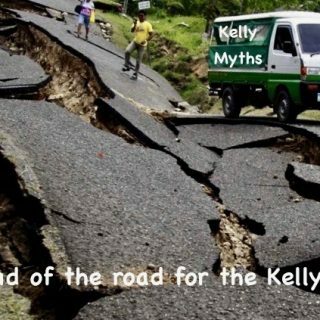 Therein may lay another dark chapter in Kelly folklore that a good investigative journalist may yet uncover. "With regard to the question of forfeiting the selection at Greta of Mrs Kelly alias King, I beg to share that this woman and her family have since they came to the North Eastern District lived by immorality and dishonesty. The house occupied by her up to the time of her conviction has now gone to decay and her family has moved to a house on an adjoining selection belonging to one Williamson. This man, together with Skillion, Mrs Kelly's son in law, is now undergoing a sentence in Pentridge. The forfeiture of Mrs Kelly's selection would of course prevent the family from returning to the old house but as it is so desirable that there should be a complete clearance of her family from this locality I would recommend the forfeiture of Williamson's selection also.."
In the meantime, I found tonight in MacFarlane's "The Kelly Gang Unmasked" book (p. 45) that Victoria Police considered that Ellen Kelly could read and write well, citing the Greta Watch-house book 1870-1882 in the Victoria Police Historical collection (9). I assume the 9 in brackets is the page number. MacFaralne also notes Ellen fibbed about her age for the wedding certificate, reporting she was in her later thirties when she was actually in her forties. All this has nothing to do with the record I remember seeing 20-odd years ago. 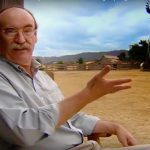 Failed research into George King's Californian background took place last century before ANCESTRY and other genealogical aids came into place. I bet George could be 'found' now. 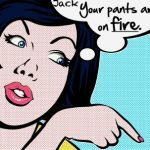 C'mon Fitzy, you claim to be a 'genie' – get busy! I can't be bothered myself. I only want to know if he was a Californian horse thief as claimed in the pro-Kelly literature, and whether he ever returned to California. Anyone know where to find Ellen Kelly's prison record? That should say if she could read or write? Yes, it looks like I'm going to have to pull my head in. Ian Jones may well have been right. I'm not finding the confirmation I expected.In fact the opposite so far. McMenomy says Ellen was illiterate. Ellen signed her marriage certificate to John Kelly with her mark, and son Edward Kelly signed his Dad's death certificate. Isuppose you couldn't find out from the writings of the descendents? Ellen could neither read or write. Spoken word from my long departed grandmother who as a young girl lived opposite Ellen Kelly. She told me many things about her but one was that she asked at one time for my grandmother to write a list for the store as she could not write at all. Thanks Darren and Sharon. I had a feeling a bit ago that people here were showing some forbearance in not tipping me over earlier. Although conceding defeat, I am only 3/4 way through Morrissey's thesis. Prof Moloney's researcher broadly worked through many of the same archival records, but I could discover nothing confirmatory there today. All good Dave. Nothing wrong with having an opinion and being open to discussion about it. We are all wanting to find the truth. Nothing more or less. Where are the 'writings of the descendants' to be found? The huge problems is that the descendants never made themselves known or indicated they were prepared to share information. The obvious assumption was that, in their silence, they were unapproachable and not willing to share anything. That's what silence means. If they are in fact willing to share information and details, you should give an email address so that future authors and writers can contact descendants through an safe address that can pass on questions to the right descendant. Until that happens, I will think of you as a time-waster leading everyone nowhere. I am a direct decendant of Alice King ,she was my grandmother,no one ever asked me for my DNA and am happy to do so if asked. There are only 2 of her grand children left alive. Interesting Anon. Are you familiar with Leigh Olver? I am more than happy to hear from you privately? Click on my name and you can grab my details? Cheers. Thanks. This anonymous person says Alice King was his/her Grandmother. Alice had two children to a Mr Dawe- according to Corfield. In that case this anonymous persons mother must have been either Alices daughter Jean Kendal ( nee Dawe) , or the wife of her son John Dawe. He/She will have he same mitochondrial DNA as Leigh Olver IF this persons mother was Jean. But that gets us nowhere in sorting out the issue in question! The issue is did they both have the same GREAT grandfather – ie George King. If they did then the NSW prisoner George King was not the one Ellen married. What you would like genetic analysis to show is do Leigh and this anonymous person have enough non Kelly ( ie King) genetic material in common to be able to say they probably had the same great grandfather. I don't even know if thats possible but these days you never know. Just trying to clarify the situation before you get lost in the genetics Mark! Fitzy is really person to do this. He is very good at this type of thing. Pull the other one Mark! It makes a “cuckoo” sound. I own Gladstone House in Camp Street Beechworth and have been researching the history of our house built in 1858. I have acquired the first conveyances and found that our land was the result of a sub-division in 1858. The 1865 conveyance sets out the details of the original 1858 sub-division and names the purchasers for each of the three smaller parcels of land. The purchaser of the land next door to Gladstone House was Mr George King. My neighbour who owns that house has been told this George King is the the man who married Mrs Kelly. This may be more likely as his age in 1858 would have to be old enough to purchase land and therefore by 1873, he would be more likely to be close in age to Mrs Kelly or potentially older. Unfortunately, the conveyance does not state what his occupation was. If this is the real George King, it eliminates the horse stealer as he was only 9 or 10 years old in 1858. This conclusively shows there was another person called George King living in Beechworth and may be the right man. Additionally, the rate books for the 1860's show that by the mid 1860's George King no longer owned this property and therefore would have been living elsewhere. Thanks heaps for that comment, I think you might be on to something there. My potentially testable theory is that because George the horse stealer couldn't possibly have been the father of Ellen (King?) born in 1873, then her descendants will have different paternal genetics from the next two children Ellen gave birth to, as these were definitely fathers by "George King". On the other hand of all three of those children descendants have. similar paternal genetics, they were all fathered by the same George King and it couldn't have been the horse staler from NSW. So maybe it was your GK from Beechworth. As you say he was a more appropriate match, age wise. Much has been made of the age disparity but maybe thats a revisionist view based on a false assumption that the horse staler was the GK Ellen married. I hope we get some more ideas from readers to advance this suggestion of yours. 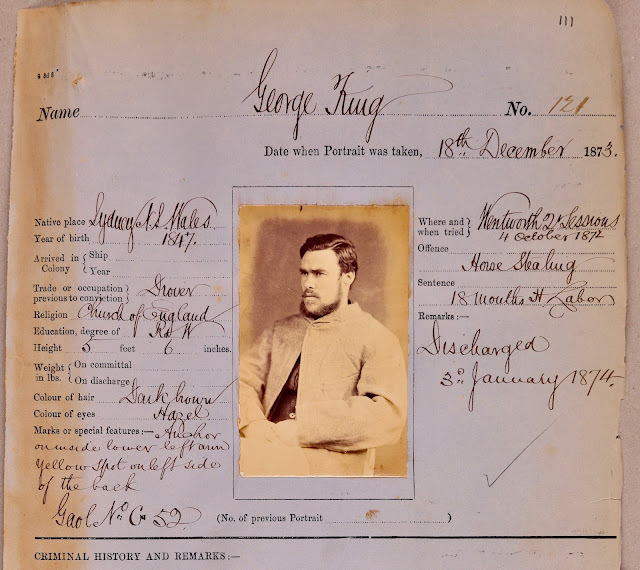 The George King in the prison photo was my great-uncle, a sailor born in London in 1851. He called himself George King (the name of his maternal grandfather)when in Australia and claimed to be American when he was, in fact, British. He adopted another name later in South America. I have inherited a letter from him claiming innocence of the horse-stealing charge for which he was imprisoned. Upload attachment (Allowed file types: jpg, gif, png, pdf, doc, mp4, mpg, maximum file size: 128MB. This publication is by far the most important Kelly related publication in the last few years.Click the image to get a FREE copy.